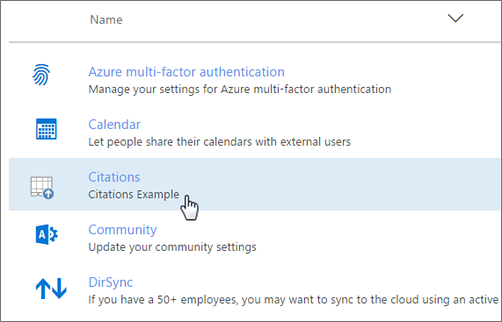 The Office 365 admin center makes it easy for an administrator to deploy Office Add-ins to users and groups within their organization. 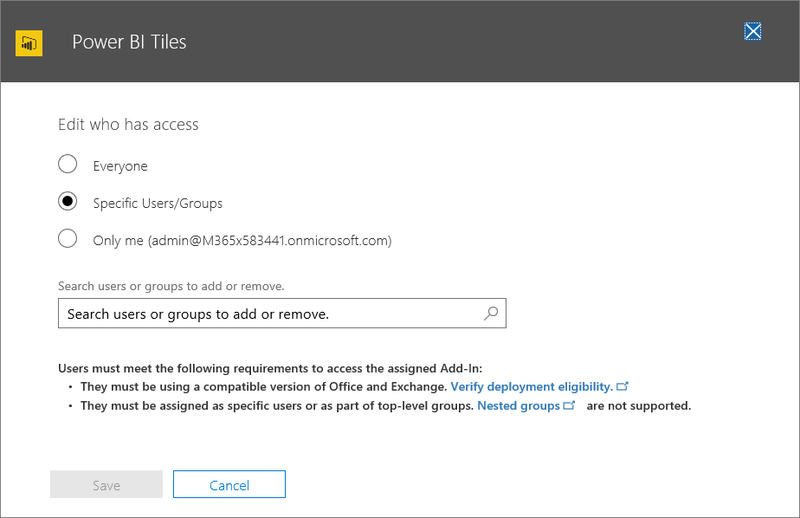 Add-ins deployed via the admin center are available to users in their Office applications right away, with no client configuration required. You can use Centralized Deployment to deploy internal add-ins as well as add-ins provided by ISVs. Centralized Deployment of new and updated add-ins to individuals, groups, or an organization. Deployment to multiple platforms, including Windows, Mac, and Office Online. Deployment to English language and worldwide tenants. Deployment of add-ins that are hosted within a firewall. Automatic installation of an add-in for users when they launch the Office application. Automatic removal of an add-in for users if the admin turns off or deletes the add-in, or if users are removed from Azure Active Directory or from a group to which the add-in has been deployed. Centralized Deployment is the recommended way for an Office 365 admin to deploy Office Add-ins within an organization, provided that the organization meets all requirements for using Centralized Deployment. For information about how to determine if your organization can use Centralized Deployment, see Determine if Centralized Deployment of add-ins works for your Office 365 organization. In an on-premises environment with no connection to Office 365, or to deploy SharePoint add-ins or Office Add-ins that target Office 2013, use a SharePoint add-in catalog. To deploy COM/VSTO add-ins, use ClickOnce or Windows Installer, as described in Deploying an Office solution. Deploy the add-in to a small set of business stakeholders and members of the IT department. If the deployment is successful, move on to step 2. Deploy the add-in to a larger set of individuals within the business who will be using the add-in. If the deployment is successful, move on to step 3. Deploy the add-in to the full set of individuals who will be using the add-in. Depending on the size of the target audience, you may want to add steps to or remove steps from this procedure. Before you begin, confirm that your organization meets all requirements for using Centralized Deployment, as described in Determine if Centralized Deployment of add-ins works for your Office 365 organization. If you see a message on the top of the page announcing the new Office 365 admin center, choose the message to go to the Admin Center Preview (see About the Office 365 admin center). Choose Next after reviewing the requirements. I want to add an Add-In from the Office Store. I have the manifest file (.xml) on this device. For this option, choose Browse to locate the manifest file (.xml) that you want to use. I have a URL for the manifest file. For this option, type the manifest's URL in the field provided. If you selected the option to add an add-in from the Office Store, select the add-in. You can view available add-ins via categories of Suggested for you, Rating, or Name. 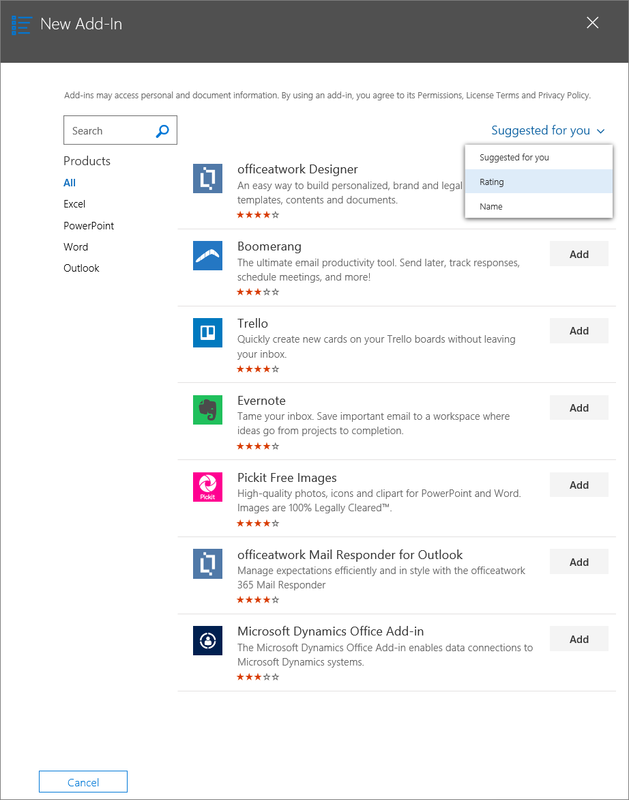 You may only add free add-ins from Office Store. Adding paid add-ins isn't currently supported. With the Office Store option, updates and enhancements to the add-in are automatically available to users without your intervention. Choose Next after reviewing the add-in details. On the Edit who has access page, choose Everyone, Specific Users/Groups, or Only me. Use the search box to find the users and groups to whom you want to deploy the add-in. A single sign-on (SSO) system for add-ins is currently in preview and should not be used for production add-ins. When an add-in using SSO is deployed, the users and groups assigned are also shared with add-ins that share the same Azure App ID. Any changes to user assignments are also applied to those add-ins. The related add-ins are shown on this page. For SSO add-ins only, this page displays the list of Microsoft Graph permissions that the add-in requires. When finished, choose Save to save the manifest. This process may take up to three minutes. Then, finish the walkthrough by pressing Next. You now see your add-in along with other apps in Office 365. When an administrator chooses Save, consent is given for all users. When you deploy a new add-in to users and/or groups in your organization, consider sending them an email that describes when and how to use the add-in, and includes links to relevant Help content, FAQs, or other support resources. Users: If you assign an add-in to individual users, you'll need to update the Central Deployment settings for the add-in each time you want to assign it additional users. Likewise, you'll need to update the Central Deployment settings for the add-in each time you want to remove a user's access to the add-in. Groups: If you assign an add-in to a group, users who are added to the group will automatically be assigned the add-in. Likewise, when a user is removed from a group, the user automatically loses access to the add-in. In either case, no additional action is required from the Office 365 admin. In general, for ease of maintenance, we recommend assigning add-ins by using groups whenever possible. However, in situations where you want to restrict add-in access to a very small number of users, it may be more practical to assign the add-in to specific users. The following table describes the different states of an add-in. Active Admin uploaded the add-in and assigned it to users and/or groups. Users and/or groups assigned to the add-in see it in the relevant Office clients. Turned off Admin turned off the add-in. Users and/or groups assigned to the add-in no longer have access to it. If the add-in state is changed from Turned off to Active, the users and groups will regain access to it. Deleted Admin deleted the add-in. Users and/or groups assigned the add-in no longer have access to it. 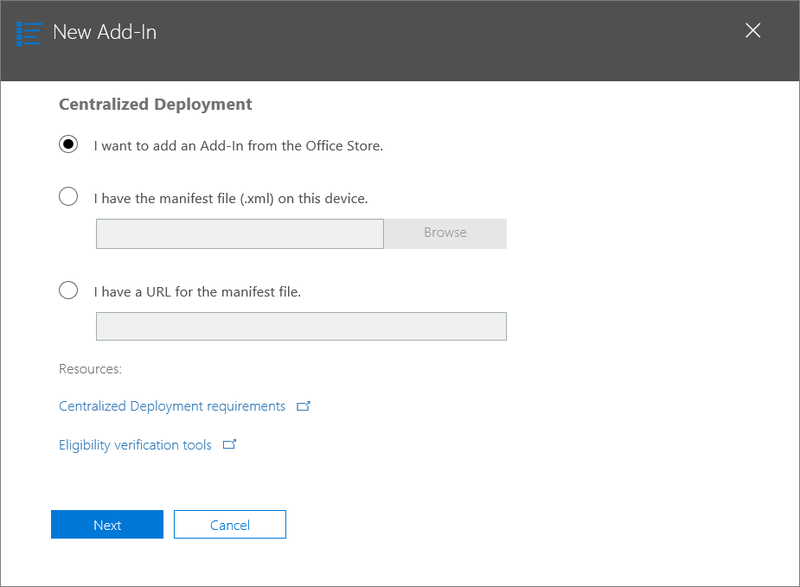 Line-of-business add-in: If an admin explicitly uploaded a manifest file when implementing Centralized Deployment via the Office 365 admin center, the admin must upload a new manifest file that contains the desired changes. After the updated manifest file has been uploaded, the next time the relevant Office applications start, the add-in will update. 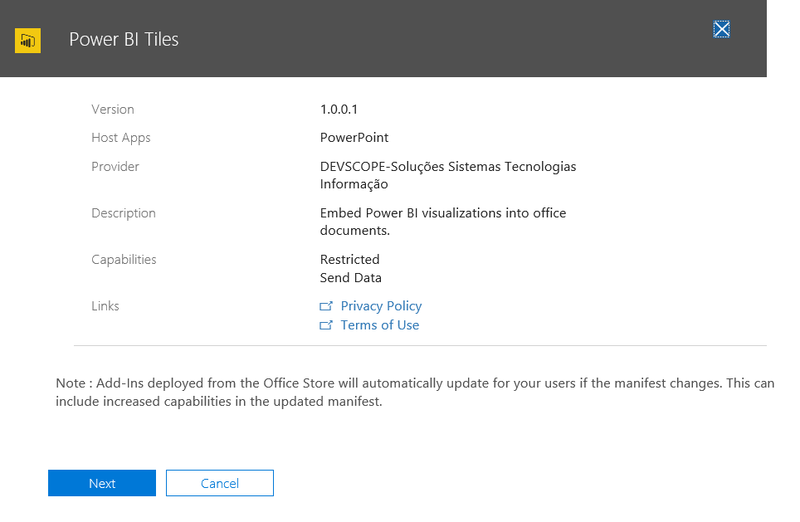 Office Store add-in: If an admin selected an add-in from the Office Store when implementing Centralized Deployment via the Office 365 admin center, and the add-in updates in the Office Store, the add-in will update later via Centralized Deployment. The next time the relevant Office applications start, the add-in will update. After an add-in has been published via Centralized Deployment, end users may start using it on any platform that the add-in supports. If the add-in supports add-in commands, the commands will appear on the Office application ribbon for all users to whom the add-in is deployed. 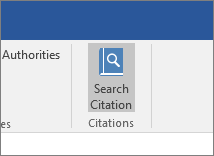 In the following example, the command Search Citation appears in the ribbon for the Citations add-in. In Word 2016 or later, Excel 2016 or later, or PowerPoint 2016 or later, choose Insert > My Add-ins. Choose the Admin Managed tab in the add-in window. Choose the add-in, and then choose Add. In Outlook, choose Home > Store. Choose the Admin-managed item under the add-in tab.